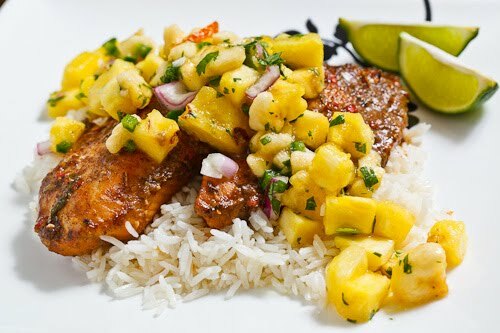 Baked white fish marinated in Jamaican jerk sauce served over coconut rice and topped with a banana an pineapple salsa. It has been a while since the last time I did a Jamaican jerk dish and I had been craving one for the last few days. Since I have been trying to keep things on the lighter side I figured that a jerked fish dish would be perfect. I kept things pretty and simple and I went with my favourite homemade jerk marinade recipe which I marinated the fish in for several hours ahead of time. I often like to serve jerk dishes with a fruity salsa and this time I went with a banana and pineapple salsa whose sweetness and juiciness would nicely balance the heat from the spicy jerk marinade. I served the fish over some jasmine rice that I cooked in coconut milk to keep the fruity theme going. Overall this is a really amazing light, quick and tasty dish that certainly satisfied my cravings for a Jamaican jerk dish! Marinate the fish fillets for at least two hours in a ziplock bag in the fridge. Bring the rice, coconut milk and water to a boil, reduce the temperature to medium low, cover and let simmer until the rice is tender and the liquid has been absorbed, about 20 minutes. Meanwhile, place the fish and the marinade in a baking dish and bake in a preheated 350F/180C oven until cooked, about 15-20 minutes. Serve the jerk fish on the coconut rice and top with the banana and pineapple salsa. Now I'm craving that jerk fish. Nice to serve it with a fruit salsa. kevin i love this salsa. this is definitely a salsa that screams grilling outside. Yum! I love all the flavors here- makes me wish I was on a tropical vacation! Thanks for this one. I am going to make it for sure. That looks really good! I love the flavors. So exotic and fresh. I feel like one bite of this dish would transport me straight to the tropics! That banana pineapple salsa ALONE would! Sounds like my kind of dinner, light, fresh and full of flavor! Thanks! What an amazing combination Kevin! Love the simplicity. Keep meaning to make a jamaican spice mix too. Wow! This is a very interesting recipe with banana! Thanks for the great idea! This sounds absolutely delicious!! Can't wait to try it! This dish makes me feel like I am on an island-it tropical and warm. Awesome. This recipe is a homerun! This jerk recipe is the best I've ever had. And I'm not normally a fan of fruity salsas but the sweet cool flavors of pineapple and banana compliment the spiciness of the jerk perfectly. I used habaneros in the jerk and salsa….superb! MMMMMM this sounds amazing! Do you use the whole batch of marinade? Does the marinade keep? MommyTanya: I used the whole batch of the marinade because I wanted to to bake the fish in it to help keep it nice and moist. You could easily use only half of the batch and save the rest for another dish and it should keep in the fridge for at least a week.